If current trends hold, the port of Laredo is on pace to welcome about 60 percent more Cubans than it did last fiscal year. Why the exodus when the island-nation is on the verge of reestablishing ties with the U.S.? Call it another immigration surge of the United States’ own making. But unlike last summer’s crisis of children and families arriving from Central America, lawmakers aren’t quick to call on this current group of refugees to go home. From October 2014 to June 2015, about 18,520 Cubans have sought entry to the United States through Texas’ Laredo field office of U.S. Customs and Border Protection, which includes ports from Del Rio to Brownsville. That’s compared to the 18,240 unaccompanied minors that were caught or surrendered to U.S. Border Patrol in the Rio Grande Valley from October 2014 through July of this year, according to CBP statistics. If current trend holds, the number of Cubans seeking entry through Laredo will be about 24,700 this fiscal year. That's about 60 percent more than 2014’s 15,600 and nearly twice as many as 2013’s 12,445. The influx of Cubans to Texas is a result of the Obama administration's efforts to normalize relations with the communist Castro regime, said Marc Rosenblum, deputy director of the U.S. Immigration Policy program at the Migration Policy Institute, a Washington-based think tank. The special status is a policy allowing Cubans who make it to a U. S. port of entry to enter and seek legal permanent residency status, known as a green card, after one year. Unlike the Central Americans smuggled illegally through Mexico, the Cubans can travel freely through the country as they migrate northward. “We’re seeing a surge that started with the announcement of normalized relations last year and there is a longer-term trend of people coming to Mexico rather than risking the sea voyage because [Mexico] is a more reliable way to go,” Rosenblum added. Though the number of Central American minors is down from last summer’s massive wave when more than 46,000 came to Texas through the Rio Grande Valley, the political firestorm that surge created still rages. Before taking office as Texas governor, Greg Abbott filed a lawsuit while attorney general to halt President Obama’s immigration policy that would have shielded millions of undocumented Texans from deportation. That policy is still on hold and Abbott cited last summer’s crisis as one reason he filed the lawsuit, claiming Texas witnessed firsthand the ill effects of Obama’s policies that included 2012's Deferred Action for Childhood Arrivals. Texas Republican U.S. Sens. John Cornyn and Ted Cruz have also cited Obama’s immigration policies as a magnet that lures more undocumented immigrants toward Texas and blasted the president during last summer’s surge. Cornyn filed legislation last summer that, if passed, would have allowed for the immediate deportations of Central Americans and Cruz has promised to scale back Obama's immigration policies if elected president. Neither Abbott nor Cornyn responded to a request for comment. Cruz, whose own father fled Cuba and settled in Texas, also declined to comment. The current policy toward Cubans is an amended version of the 1966 Cuban Adjustment Act, which applied to most immigrants from the island nation who sought entry to the United States. Under a revision agreed upon during the Clinton Administration, called the Wet Foot/Dry Foot policy, Cubans who reach the United States can apply for entry while Cubans found at sea are sent back home or to a third country. 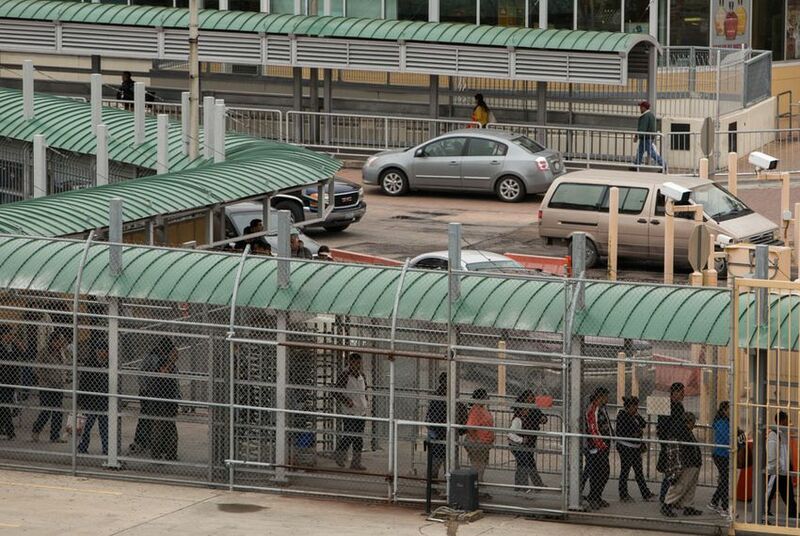 Rick Pauza, a spokesman for CBP in Laredo, said the current negotiations between the United States and Cuba have not affected long-standing policy regarding Cubans seeking entry to the country. Immigrant rights’ groups have been critical of what they say is a double standard in U.S. immigration policy. They argue that instead of being detained or deported, a Central American or Mexican escaping persecution should be paroled in to the country like a Cuban is. Rosenblum said that’s a valid argument. In 2013, the estimated 18,000 Cubans who arrived at U.S. land ports were paroled into the country and subsequently awarded green cards, Rosenblum said. Though Cuba and the United States have started a dialogue, Rosenblum said he didn’t see immediate change on the forefront. “I think for sweeping change you would want to see legislation and that’s unlikely because this is a hard issue for Congress to take up, particularly as we enter an election season,” he said. But the administration could roll back current provisions that allow DHS to issue Cubans green cards. That notion could even garner some GOP support he added as some Republicans have already expressed concerns that some of the Cubans arriving in the United States could be considered criminals in their country. Rosenblum said that according MPI data, about 90 Cubans have been deported every year since 2009. Most of them had criminal records, he said.